Our campaign was founded in November 2013 by health professionals who were desperately worried about what they believed was an increase in preventable deaths at Norfolk and Suffolk NHS Foundation Trust (NSFT) as a result of the ‘radical redesign’, which saw assertive outreach and homeless teams closed, link workers in GPs surgeries abolished, entire hospital wards closed, crisis and community teams savagely cut and hundreds of experienced and highly-trained mental health professionals paid to leave mental health services. NHS staff were rapidly joined in our campaign by service users, carers and concerned members of the public. How did NSFT’s Board react to these legitimate concerns? NSFT Board members sent emails demanding that staff members who were involved in our campaign were removed from their jobs. NSFT Board members denied NSFT’s own data and called our campaigners liars. NSFT executives sent insulting and defamatory messages on the NHS email system speculating wildly and incorrectly about relationships between campaigners. NSFT doubled its expenditure on ‘Comms’, sent staff to report on our meetings and increased its ‘vanity publishing’ magazine, Insight, to the size of mail order catalogue from the 1970s. When we asked about patient deaths at the NSFT Board meeting at Swaffham back in June 2014, one non-executive director, still a Board member, called our measured and legitimate questions ‘disgraceful’ and demanded that they were struck from the minutes. When campaign supporting governors raised concerns about the increasing number of deaths, they were treated disgracefully, as though they had said the Emperor had no clothes and were ridiculed, isolated and ignored. When we raised concerns on our campaign website, NSFT spent thousands of pounds meant for the NHS on lawyers to try to silence us. When the issue of unexpected deaths was raised on BBC Look East, the Director of Nursing told one million viewers that we had not turned up to a meeting about unexpected deaths to which she knew we had never been invited and was subsequently forced to apologise in front of the Improvement Director from the regulator, Monitor. When we raised the salary increase, relocation expenses and previous fat cat behaviour of NSFT’s Chief Executive, Michael Scott, he stopped talking to us. When the number of unexpected deaths continued to rise, NSFT simply removed the section about unexpected deaths from its Annual Report and Accounts. When denial and secrecy proved insufficient, the Chief Executive of NSFT, Michael Scott, resorted to a wide range of excuses, including that NSFT is a ‘high reporter’, that it is ‘treating more people’, ‘complex conditions’, ‘aging population’, ‘drug users’, etc. However, the graph above, which was first shown on BBC’s Panorama, is of the number of unexpected deaths per 100,000 unique service users, so ‘treating more people’ does not explain the massive increase. 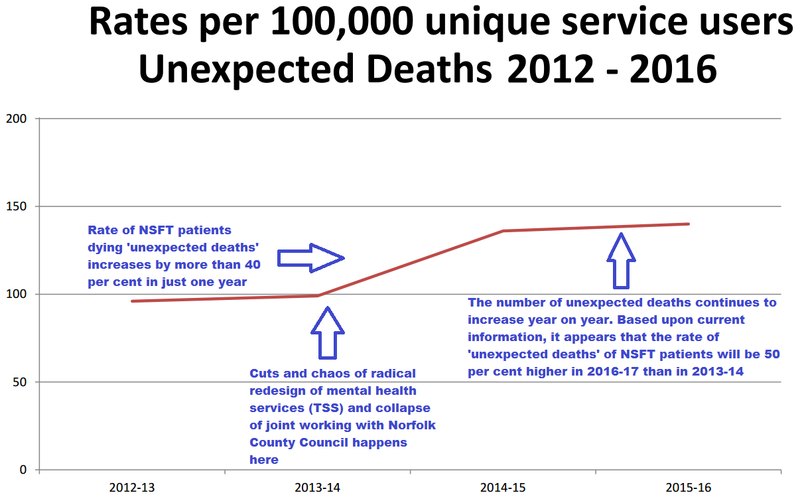 Under robust questioning by members of Norfolk County Council’s Health Overview and Scrutiny Committee, Michael Scott confirmed that NSFT has not changed its reporting of unexpected deaths, so being a ‘high reporter’ fails to explain the dramatic rise in deaths. People in the general population aren’t dying ‘unexpected deaths’ at a rate more than forty per cent higher so why is it acceptable for people who rely on mental health services? No surprise there. I’ve got a personal letter from Micheal Scott in which he tells me that not only is he and NSFT completely ignoring the complaints made against them, they will not communicate with me on the matter again and that Dr [redacted] is the only person who will make decisions upon my care. This despite part of the complaint against NSFT being that Dr [redacted] misrepresented and lied in an official report and that this was the subject of a separate complaint with Dr [redacted]’s professional body. Consequently despite Scotts and NSFT insisting that Dr [redacted] is the only person charged with decisions upon my care, Dr [redacted] has not had any contact with me since Nov 2016 and i find myself ‘parked’ far away from NSFT and any chance of care. Oh and BTW i’m considered med to high risk of suicide by GP and NSFT. CCG are all smiles and niceness til you say you want to complain, then they refuse to engage, refuse responsibility and insist erroneously and i suspect unlwfully, that you have no recourse other than stressful complaints and referrals to PHSO. Against such a backdrop, are rising unexpected deaths a surprise? This still remains the most important issue for users of NSFT’s services. Why are the governors and the non-executive directors not challenging the Board of Directors? Why are not the monitoring organisations stepping in?